If I had to guess, I’d say that your hiring process goes something like this: you throw a job posting on Craigslist, Monster, Indeed or LinkedIn and expect people to come through. You go through a bunch of resumes, call up some of the better candidates, then invite your favorites to an interview. You might even do some reference checks, and then you make the job offer right there. I think most of us can agree that there are ways we can improve this incredibly-important-but-quickly-becoming-outdated hiring process. So how do you make this old way better? Let’s talk about the concept of trial week. 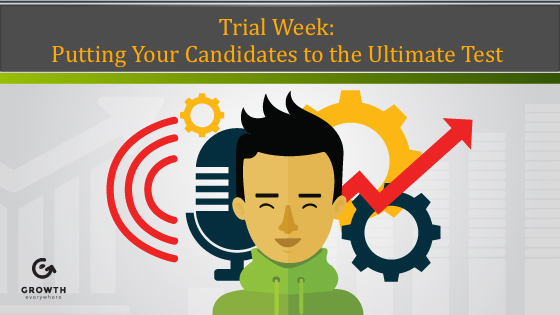 Most companies do a 3-month trial, but trial week is even more high stakes. Have your final candidates come in and work for you for a week. Put them on your team and see how they work, interact and communicate. Basecamp does something very similar for hiring. After looking at resumes, they interview candidates using Skype. And they take their time with these chats. Let’s say you’re at a conference or you’re traveling—you chat for a bit, then travel a little, then a couple hours later you can come back and continue the conversation. It’s not even like you’re driving them through an interview process; it’s more like a long email chain, just through Skype. When it seems like there’s a fit, they move a candidate into a trial week. After the interview process, they might say, “Hey, we’ll pay you for a small project.” This lets Basecamp continue to evaluate all the small nuances of a candidate, like how well they communicate with your team, how well they do their work, how well they fit with the culture, etc. They also compensate these people so they’re not wasting their time. When we put somebody through trial week, we think about how they are as a fit within our team. Just because somebody produces great work doesn’t necessarily mean they’re a long-term fit. If they’re annoying, even if they do the work well, they’re not the right fit. If they spend all their time thinking about themselves, their output and their performance rather than the goals of the team, they’re not the right fit. We want to see if this person can open our minds up a little more, if they’re going to teach us something, and if they actually know what they’re talking about. Because there’s a lot of smoke and mirrors in marketing interviews. Let’s say you’re looking to hire an operations person. You can run them through a situational interview with a trial week. You can also have them do the actual work. Maybe have them look at your P&L or your balance sheet and have them make some recommendations. Give them some homework, too. The tricky part is figuring out the right workload balance. You want to have people complete projects that show their true skills. But at the same time, you don’t want to make it too extensive since a lot of people that you’re interviewing have full-time jobs. In some cases we’ve found really good people, but they don’t have the time to work on projects. All in all, I can’t stress to you how important trial week is. Just recently, I almost made a mistake in hiring. This person did really well on the video interview and wrote an in-depth PowerPoint presentation. Then we put him through trial week and the communication skills were just not there. There were a lot of different issues. We avoided hiring someone that looked really good on paper but wasn’t actually the right fit thanks to the trial week process we had in place.